It is easy to come up with contexts where atomised assessment gives an unrealistic picture of student progress in the things that really matter but holistic assessment lacks the granularity we need to identify next steps and progress. Think about developing the NZC Key competencies, the science capabilities, conducting social inquiry, thinking like a historian, writing a narrative, the different stages in student inquiry and when ensuring composing, performing and listening skills are integrated when building student musicianship. Finding simple ways to do this can make a big difference to learning conversations and next steps for learning. 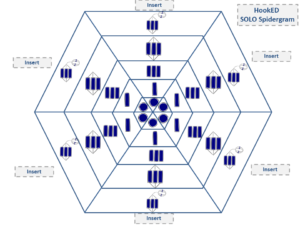 This is why I have been so excited by what teachers and students are doing with the SOLO Spidergram – I am featuring this work in two new SOLO books to be released by Essential Resources later this year (SOLO in Student Inquiry and SOLO in Music) . The SOLO Spidergram use SOLO levels to show student progress (holistic and itemised), over time. Like the rubric and matrix the SOLO levels can represent both functioning (skill – knowledge how to) acquisition and declarative (knowledge about) outcomes. In the case of the SOLO Spidergram a key to descriptors of what each level represents helps ensure the visual simplicity of the Spidergram itself.